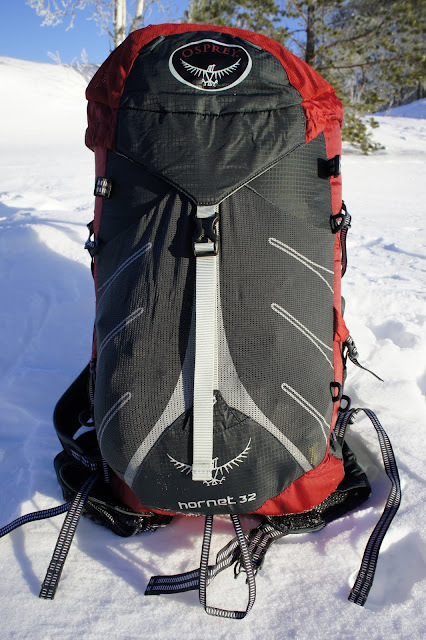 I've been using one backpack in the last month almost exclusively, from skiing and snowshoeing trips to going to school and taking it food shopping, and that is the Osprey Hornet 32 backpack. It is a new fast & light backpack from a major player, so it is always good to have a look and see their take on lightweight backpacks. Welcome to Hiking in Finland, Osprey! Or view it on Youtube. The pack is 593 gram on my scale, Size M/L. These 593 gram get you a 32 liter backpack, with a few extra liters if you count in the two lid pockets, two hipbelt pockets, the big front mesh pocket and the hydration pocket which holds reservoirs up to 3 liters, though it is most comfortable with the Osprey HydraForm 2l pack (which is awesome, btw!). The inside lid pocket, up-side-down. Lets start on the top. 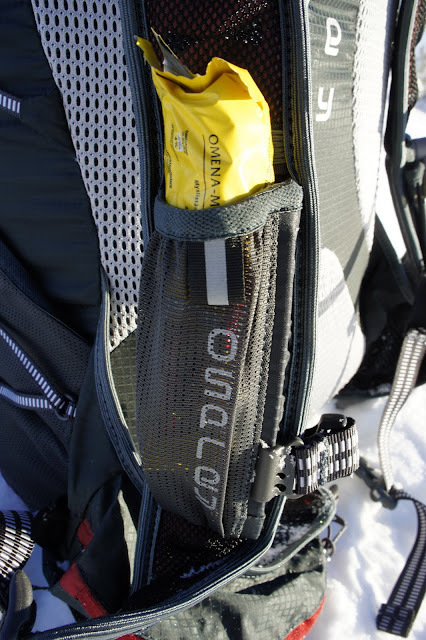 The top lid pocket is covered by mesh, so keep things which need to stay dry inside the pack. But sunglasses, snacks, and waterproof packed stuff can go fine in there, as there's plenty of space. If you open the lid you find another pocket, and while this is also mesh, because it is on the inside I feel comfortable and safe carrying maps, charger or other stuff which needs to stay dry in there. You can take the lid completely off, saving you some weight, though it can't be used as a fanny pack or similar. The two hipbelt pockets are similar to the lid pockets - one more waterproof with a solid cover, the other pure mesh. They're big enough for s few snacks or a small compact camera, but I didn't find them super easy to open and close - then again, which hipbelt pockets are? The hipbelt itself is fine, the buckle is small but easy to operate (also with woolen mitts) and to tighten the belt you pull inside - which is far superior to pulling outside, in my opinion. It carries well, and despite me having a long back and it riding a bit high when I pull the shoulder straps very tight, it is good. I only use the hipbelt when skiing in the forest, otherwise the sternum strap is sufficient for my needs. Something which I haven't seen before was the outside reservoir pocket. 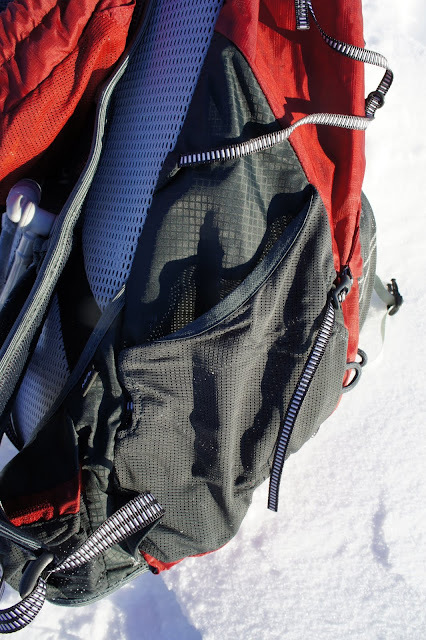 It is a good idea, as in this way you can access your reservoir quick and easy - no opening your main pack, fishing the reservoir out and stuffing it back in, maybe getting your gear inside wet or dirty. A drawback I found with it is that if it is snowing, snow gets into the pocket, as it is open to the top and can not be closed. Same goes for leafs, small twigs and other stuff which finds its way in when you bushwack through the forest. But because it has a drain grommet in the bottom, at least water and snow are less of a problem. Backpanel and one of the pockets on the shoulder straps. The backpanel is soft and has a removable CCF pad in it, and I found it especially comfy when having the 2 l HydraForm reservoir in there as well, as it has a sort of backpanel. However, also without the reservoir it is good, and I found it perfect for skiing, snowshoeing, school and grocery shopping. The shoulder straps have a die-cut foam in it, between two layers of mesh, with the inside having a softer mesh to add some cushioning. The pockets on the shoulder straps are nice, if you carry a small & narrow GPS or phone, or want to have your snacks close you will like these. An iPhone doesn't fit in, sorry folks! The front pocket is good, a bit tight maybe and with the two buckles to close it, it can be a bit slow if you need something fast. But it stores a UL tarp fine, as well as snacks, extra gloves and buff with some room to spare. The main pocket is big. 32 liters is plenty for a UL summer trip, and I think that's where new lightweight and UL backpackers will take this pack. 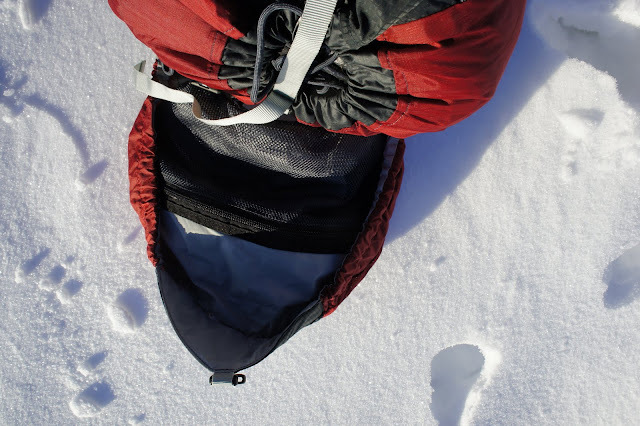 Now in winter I carry extra puffy insulation, a 1l thermos flask, binoculars, a book, papers, iPad, camera, spare socks, gloves and gaiters in it, and yes, there's still room. It is massive. Sadly it is a cinch closure, and I always find that the cords get in the way and flies around where it shouldn't, but that might just be my inability to use it correctly. There's a buckle which goes over the cinch cord closure, and that buckle is connected to a strap which has another buckle! The 2nd buckle allows you to close the front mesh pocket and keep it tight. Over that then goes the lid... with another buckle! Lots of buckles, you see. 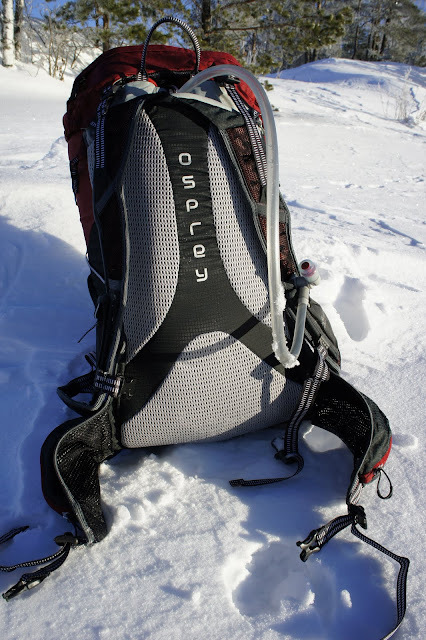 I think here Osprey should simplify, less is sometimes more. Then there's a ice axe loop at the bottom, and plenty of cord tie-off points around the pack to put own cord through to attach gear. Add in a lifting loop and a sternum buckle with a whistle and you have a fine pack with plenty of details. The side pockets are OK. They seem a bit loose and are too small for a 1l Platy, and the side compression straps, while a good idea, are meh. The sidepockets on the Hornet 46 are the full length of the site, thus should be better to hold 1l Platys and other water bottles. Which brings us to the conclusion. I think the major advantage of this backpack is that you can walk into any outdoor shop, load it up with about 5 kg of gear and try it. You can't do that with a cottage backpack, and there's still those people who'd like to try a backpack on before buying it (Return shipping policies in the USA might be great, but in Europe they're backwards and a lot of hassle most people don't want to bother with). You also can get it immediately and don't need to wait 8 weeks or more for it to arrive. And what better way to get into lightweight backpacking than trying something in the shop? Maybe the shops even start to understand that lighter = healthier & better, and carry more gear for our needs. Anyway. There's a lot of details on this pack, or bells & whistles, as I like to call them, maybe a tad too much for my taste - but you always can take scissors and cut these off,which is easier than taking a needle and thread and sew them on. It is comfy, carries weight up to 8 kg well, looks good and has some smart extras. I like it. On a recent Snowshoeing trip.